It is my great pleasure to join you for the annual CBBC summer reception. I would like to warmly congratulate Sir David Brewer and CBBC on the success of the China 20:20 Forum earlier this afternoon. There is no better time for the forum. As the world economy recovers, it is more important than ever to boost trade among countries. In the past 8 years, the value of global trade in goods has grown by an average annual rate of 12%, twice as fast as that of the global GDP. After 32 years of reform and opening-up, China has become the world's 3rd largest economy, the biggest exporter and the No.2 importer, accounting for 9% of total world trade. China's booming trade has not only driven economic growth at home, but also offered more opportunities for global development. First, China has maintained strong growth. Thanks to the government's decisive response to the financial crisis, China was among the first leading economies to recover last year, growing by 8.7%, higher than the 8% target. The first quarter of this year saw stronger growth of 11.9%. Such positive momentum of growth in China is helpful for facilitating a global recovery. Second, China is emerging as a leading consumer market in the world. As the Chinese government works hard to expand domestic demand, consumption in China has been growing. In 2009 retail sales reached 1.8 trillion US dollars, an increase of 16.9% in real terms, the highest since 1986. The figure for this year is expected to top 2 trillion US dollars. If every Chinese spends one more yuan per day, total consumption will grow by 490 billion yuan or roughly 49 billion pounds a year. China sits on total household savings of 20 trillion RMB yuan or 2 trillion pounds. This is like a gold mine that will yield more and more gold, along with faster urbanization, better social safety net and higher wages for workers and farmers. By that time, "sold in China" will be just as common-place as "made in China". Third, China is making efforts to improve its investment climate. When international investment fell by as much as 40% in the 2009 financial crisis, investment in China only went down by 2.6%. A survey by the UN Conference on Trade and Development (UNCTAD) on several hundred multinationals shows that China remains the most attractive destination for foreign investment in 2010. Not long ago, the Chinese government issued new rules to open more sectors to foreign investment and channel more foreign capital to such sectors as high-end manufacturing, high-tech industries, modern services, new energies and energy-saving and environment-friendly industries. Foreign companies will be encouraged to join in reorganization of Chinese businesses through share-holding or merger and acquisition. Qualified foreign businesses will also be allowed to issue shares, corporate bonds and medium-term notes on the Chinese mainland. These measures will help create a more open, fair and transparent climate for foreign businesses to better share in the opportunities China offers. China-UK business relationship is the foundation stone of our overall relations. Trade has grown strongly in recent years. UK export to China almost trebled from 2001 to 2009, and its share in total UK export increased from 0.9% to 2.3%. China rose from being the 18th largest export market of the UK to No. 8 and No.2 outside the EU. UK businesses have benefited from trading with China, including in design, import, shipping, storage, wholesale and retail. Inexpensive yet high quality goods made in China reduced production cost and cost of living in the UK and helped to keep inflation down. We have seen from early this year a V-shaped recovery of our trade following the lows of last year. Trade in goods jumped by 33 to reach 17.8 billion US dollars and UK export to China grew 53% in the first 5 months of this year. It is now time to step on the accelerator. Firstly, both governments are committed to building stronger business ties to mutual benefit. Just days ago, President Hu Jintao and Prime Minister David Cameron had a positive and constructive meeting in Toronto, reaching important common understanding on promoting our business cooperation and bilateral relations as a whole. Secondly, the two countries have good mechanisms in place for dialogue and coordination, such as the Economic and Financial Dialogue and the Joint Economic and Trade Commission. They have worked well by providing policy guidance and addressing various issues. 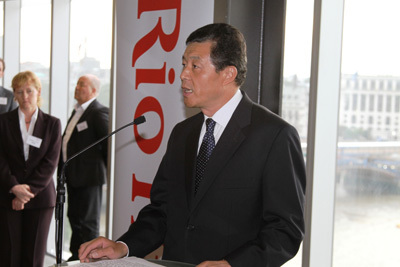 Thirdly, organizations such as the CBBC, CCPIT and association of Chinese businesses in the UK are playing their role as bridges of communications and facilitators of trade and investment. Fourthly, the two countries are both staunch supporters of free trade and are opposed to protectionism. I just returned to London late last night from a five-day visit to the Midlands and Northwest England set up by UKTI and CBBC. My visit can be summarised with three Ps: "Products, Prospects and Problems". First, understanding UK industrial products. The UK's reputation as a leader in financial services is well understood in China, but I had a new impression thanks to this visit. I visited both large manufacturers like Rolls-Royce and Boots and some small and medium enterprises. I also toured the Manchester Museum of Science and Industry. I was deeply impressed by Britain's proud history and leading edge in high-end manufacturing products and technology, particularly in aviation, automobiles and renewable energy. Second, understanding the prospect of our cooperation. Again I was deeply impressed by the depth and extent of cooperation between the two sides. Almost all of the companies I visited on this trip have business ventures in China and understand the Chinese markets very well. For some of them, China is the most profitable part of their business. From the discussions I had with business leaders in these regions, I could sense how enthusiastic they were about expanding their businesses in China and bullish about the prospect of China-UK business cooperation. Last but not least, understanding and resolving the problems that may exist in our commercial relations. It remains a challenge for both sides to convert our shared interest into practical projects and results. The two sides should work even harder to set up platforms for business-to-business contacts and draw up lists of technologies and products that may be needed by the other side. The Chinese side will continue to strengthen the protection of intellectual property rights and broaden market access according to WTO commitments. We also hope the UK side will relax export controls on high-tech products to China and support EU's recognition of China's full market economy status. All in all, I take away from my visit a belief that our economies have a lot to offer each other and our business cooperation can prosper in a wide range of areas. I very much hope that business communities of both countries will seize the opportunity to explore areas for cooperation based on our respective strength, and engage in more dialogue and mutual learning. There is every reason to believe that hand in hand, we will build a better future for our business partnership. And to a promising future for China-UK comprehensive strategic partnership.